Family: Chief of the Ohtori clan was her father. Her parents are both dead. Powers: Can transform into a giant man-eating cat (hehe knockoff Sesshy).Also, she is sometimes possessed by an evil inner monster that kills anything in sight. Weapons: Shi no seishin, a magic sword that contains the spirit once it is unsheathed.Also duel daggers called seikatsu and shi. History: Grew up spoiled. She was told by her parents that because she was a member of the Ohtori clan,she could beat any demon. Because of this,she went around bragging to stronger demons that she could easily destroy them...and was beaten to near death, until the Tenseiga made Sesshy save her. She gratefully followed him, trained with him and at one point, tried to help him kill InuYasha (she failed ^_^).Eventually, she went back to her village to find out that her mother had been killed by Naraku for no apparent reason. One day while on one of her killing sprees,she meets a half dog demon named Chinatsu and they team up to stop Naraku. Personality: Usually serious, but sometimes seriously retarded, cold, hateful, sometimes playful, rarely smiles and when she does, your in trouble. Mizuki walked through the woods. 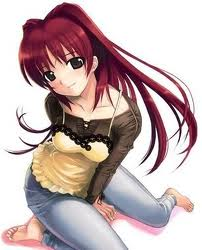 Mizuki heard someone talking and hid nearby, listening to their conversation. Weapons: Zentetsu, like Tessaiga, has it's own true form. History: As the prince, has close connections to millions of the different restaurants and places. He's even known for his skill as a half demon. When he was young he was named prince of his family, due to his abilities, he grew up like this. He has had other evil demons chasing him because of this. He trained using the Zentetsu in which he obtained from his grandfather. Neku: *walked to the 2* I don't know if I've seen you 2 around here, who are you 2? 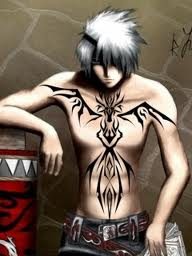 Neku: I am prince Neku, prince of the Kaganara clan. Neku: The Kaganara clan is line of nobles, from the low class, to the higher class, I represent the high class, as I am the prince. Neku: Where exactly are you from anyway? Neku: Japan Tokyo... What kind of place is that? Neku: Well, I'll say one thing, you might want to be careful around me, demons have been after me, it's be dangerous for you 2 to stay around me. Neku: Creatures of darkness, that's just about the best I can explain of it, although I'm half, I'm not much a person of darkness. I'm more so against darkness. Neku: Unlike me, a full demon has its own form, a half demon like me has a human body, so basically, I'm half human, half demon. Neku: Dog ears? Just like him... You say you're just a regular human right? Neku: Considering you have the dog ears, I'd be ready to say so. You have his ears, so I'd consider that as an option. You said it was a birth defect, but I'm a little more convinced of you being a half demon who just hasn't awakened to her abilities. Neku: It's different for everybody, it took me the pain of seeing those important to me get hurt for my awakening. Neku: It takes time and patience, don't rush it.